Our objective in this project was to examine fundamental questions of architecture, not to meet specific requirements. "Il progetto, prima che strumento di trasformazione, è strumento di conoscenza" ["The project is more a tool for gathering knowledge rather than a tool for changing things"] (Luigi Snozzi). That said, every project also changes its authors. The questions we posed included: What are the relevant features of a house? How is the relationship between public and private expressed? How does the house connect with the ground? How does it fit into the landscape? How does the structure relate to the hillside (i.e., in the absence of a horizontal or vertical support)? The house is primarily a means of physical and psychological protection in that it separates an area used by individuals from the outside world. The transitions from private to public space illustrate the relationship between individuals and society. To this extent they foster integration. The house is a transplant onto the earth's surface: It is not a symbiosis between building and built-up area but is always an artifact in dialogue with nature. The character of this dialogue is crucial for the design of the house. The triangular property on which the Casa ai Pozzi stands forms part of a steep slope at an angle to the street. We made use of a ledge in the hillside on which to site the house. Separating, i.e. freeing, the house from this slope allowed us on the one hand to select the same architectural order on all sides of the building, while on the other creating a contrast between the "facades" of the house and the topography, which itself is transformed into a "landscape facade". 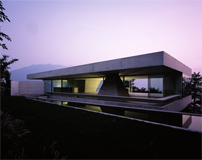 This contrast produces a more powerful effect than would have been achieved by integrating the house into the terrain. The structure is independent; the landscape context becomes part of its interior. Taken together, the two equal-sized living units form a whole. Their mirrored arrangement expresses duality and complementarity ? equilibrium in asymmetry. The house's few components form its structure or envelope. They are made of concrete so that the fit-out elements (such as handrails, kitchen and wet area) subordinate themselves to the structure as a whole. Two substantial concrete supports and three identical concrete slabs form the structure and define the space. The rectangular floor plan (12 x 24 m) is divided into interior and exterior, with one of the two supports in each. This also serves to emphasize unity. The glass facade serves only as thermal protection; it opens up onto the landscape rather than enclosing the house. The translucent drapes define the views of the landscape that flow into the house. They transform the space ? which floats in the landscape, seemingly detached from the ground ? into an intimate space that affords protection. Mathematics and proportion define the shape of the structure and the space. The sparse range of materials used retain their archaic expression. The water that flowed right across the property and down into the valley has been captured and channelled into two pools that reflect the light.